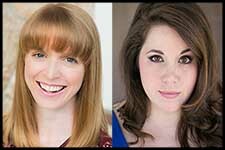 Lindsay Nantz & Kate Zaloumes debut in The Winter Park Playhouse Spotlight Cabaret Series to premiere their new cabaret, Better Together! Recently featured in The Playhouse's popular holiday show, Winter Wonderettes, the pair of professional performers have teamed up to sing standards, musical theatre classics and some contemporary hits to make this a spectacular evening! Playhouse patrons will also remember Ms. Nantz and Ms. Zaloumes from their stellar performance together in The Marvelous Wonderettes. Playhouse Musical Director Christopher Leavy will accompany on the piano. These popular cabarets sell out quickly to get your tickets today!